The grand passion of opera and the minimalist esthetics of Tony-winning director John Doyle blend perfectly in Classic Stage Company’s intimate revival of the rarely-performed Carmen Jones, Oscar Hammerstein II’s adaptation of Bizet’s classic. This is the first full New York staging of the hybrid piece since its Broadway premiere in 1943 (there were London versions in 1991 and 2007 as well as a Hollywood movie directed by Otto Preminger in 1954). 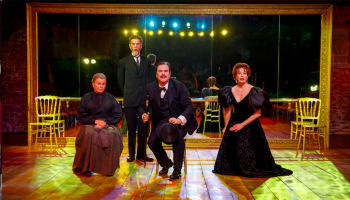 After attending a performance of the original opera, Hammerstein was struck by the universality of its themes of jealousy and uncontrolled ardor. In between collaborating with Richard Rodgers on Oklahoma! 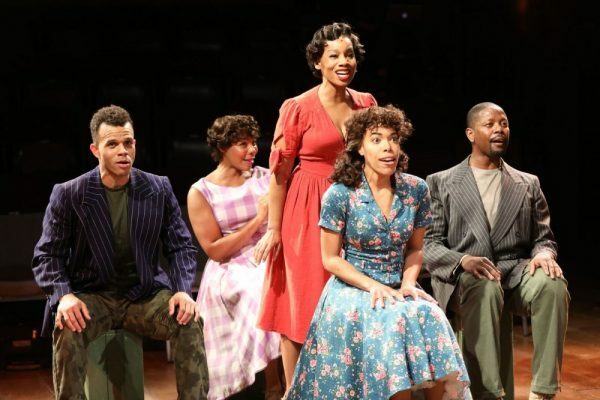 and Carousel, the lyricist transported the story from a cigarette factory in 19th century Spain to an Army base during World War II where African-American soldiers and women manufacture parachutes. 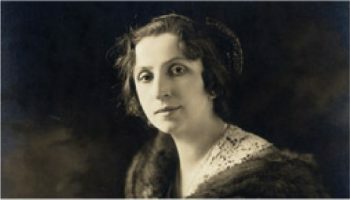 The titular gypsy became a free-living factory worker breaking hearts among the local military. 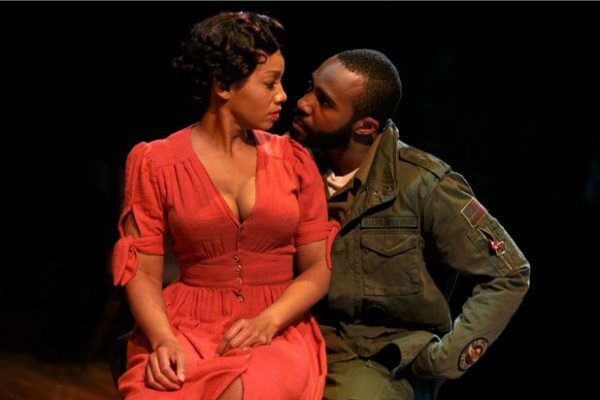 Anika Noni Rose and Trammel Tillman in Carmen Jones. 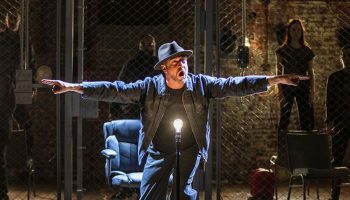 As he did with his pared-down stagings of Sweeney Todd, Company, and The Color Purple, Doyle, CSC’s artistic director, strips the material down to its essence and allows its raw, explosive power to explode fully. Set designer Scott Pask converts the company’s small space into a factory floor where boxes, chairs, and parachute fabric hung over lamps as well as Adam Honore’s versatile lighting suggest the numerous settings of the story. A spectacular ten-person cast deliver the vocal and dramatic goods, many playing multiple roles and effortlessly bridging the gap between opera and musical theater. Kudos also to music director Shelton Becton and music supervisor-orchestrator Joseph Joubert for the full-bodied rendition of Bizet’s sensuous score. Clifton Duncan and Anika Noni Rose in Carmen Jones. Carmen Jones has not been performed in New York for over 70 years probably because Hammerstein’s book and lyrics employ crude, stereotypical slang. It’s also a portrait of African-American female sexuality written by a white male. 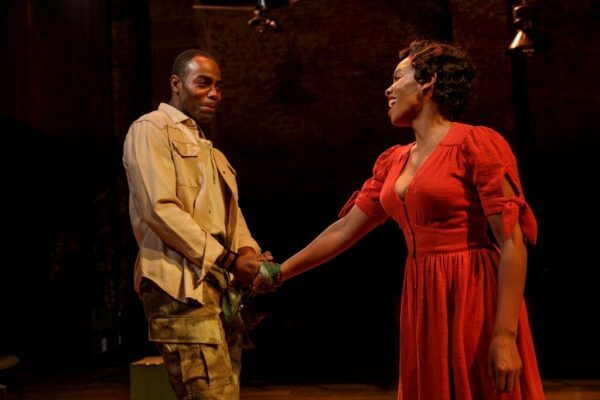 (Just like Porgy and Bess, which was adapted by playwright Suzan-Lori Parks for its most recent Broadway revival.) 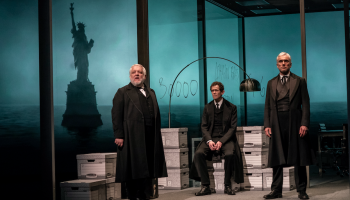 Doyle wisely downplays the exaggerated nature of the speech and emphasizes the emotional connections of the story and Bizet’s music, resulting in an unforgettable rediscovery of a curio from Broadway’s Golden Age. June 27—Aug. 19. Classic Stage Company, 136 E. 13th St., NYC. Tue—Thu 7pm, Fri 8pm, Sat 3pm & 8pm, Sat 3pm. Running time: 95 mins. with no intermission. $72—$127. (212) 677-4210. www.classicstage.org.